Standard single element housing with Vee clamp quick closure or DIN11851 closure. SCD suitable up lo 10 barg and SCR suitable up to 25 barg. 316L construction. Standard multi-element housing, closure with Rathman clamp, quick Vee clamp or reversable eyebolts. 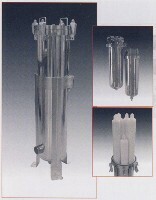 Multi cartridge housings of exceptional quality and available with various outlet orientations. BSP or other connection options. Pressure ratings up to 20 barg. 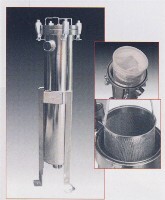 Standard single bag filter housing, closure with Rathman clamp, quick Vee clamp or reversable eyebolts. Standard single basket filter housing, closure with Rathman clamp, quick Vee clamp or reversable eyebolts. Sanitary grade, single or multi elements housings, for applications in pharmecutical, food & beverage and microelectronic industries, closure with Rathman clamp or quick Vee clamp. Special housings, with filter elements, fiter bags or basket filter, designed and manufactured according to customer's specifications. Standard single element housing and multi-element, closure with Rathman clamp, quick Vee clamp or reversable eyebolts. This housing is for the larger diameter "high flow" style elements. 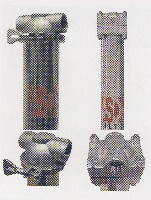 Standard single element housing, high pressure. The Asco Filtri range of metal cartridges can be used in a wide range of applications and can be cleaned and re used via specialist cleaning or back flushing in certain circumstances. We are happy to offer alternatives to existing suppliers, and can often save your company money and time in the process. Re cleanable filters could be a good option for your company for steam filtration, Polymer filtration or general process filtration. Metal filter manufacture is done by very few companies, most just buy a filter and put their name on it but Asco Filtri can offer the highest quality filters and they are made "in house". Sintered metal microfiber filter suitable for a wide range of applications from Polymer production to steam sterilisation. Materials include 316L stainless steel, Inconel 601 and Hastaloy X options. Polymer filter will withstand 103 bar differential @ 25 deg C.
CFS can offer a unique contract cleaning service for metal filters of almost all types providing an economic alternative to component replacement. Whatever the contamination or application, it is likely we can cater for your requirement. Each cleaned component is tested for cleanliness and integrity. This service is ideal for Hospital, the NHS, Pharmaceutical manufacturers etc. If a filter is beyond cleaning and mechanically flawed CFS can offer a replacement unit at a competitive cost, but we would expect each filter to withstand many cleanings.